I LOVE dessert! I ALWAYS have room for dessert! This seems to be a mystery to my fellow diners. For the Food Buzz second challenge I was asked to create a classic dish from another culture. When thinking about what to make, the first cultures that came to mind were Indian and Japanese. Once I got to thinking about the dishes that I could make I realized that it's pretty close to food I already make and love. Then I turned my focus to Mexican and Latin cuisine. Rick Bayless & Daisy Martinez are two of my favorite chefs to watch on TV. EVERYTHING they make - I want to eat. They also have so much fun when they cook. 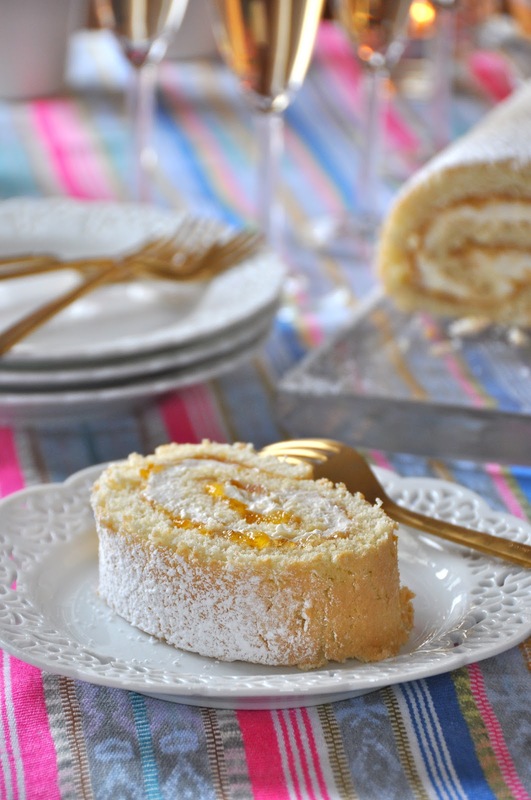 Brazo de Gitano and thought it sounded absolutely amazing and nothing like I would normally make! Plus the name 'Gypsy's Arm' just sounds fanciful! I do bake muffins and things that don't really involved precise measuring or construction. I also don't really like to bake desserts at home. I try to leave the sweets to restaurants (that way I'm not eating cake as much as I would like). So I think this cake was the perfect thing for me to make for this challenge because it got me out of my rut of just making dinners. I guess most cultures have some version of a jelly roll. The combination of flavors in this one I find particularly yummy! I don't like overly sweet desserts and the creamy filling in this cuts the sweetness of the jelly. Make the cake: Preheat the oven 350° F. Grease a 13 x 18-inch jelly roll pan with vegetable cooking spray. Line the bottom of the pan with parchment paper or waxed paper. Sift the flour, baking powder, and salt into a bowl. Beat the eggs in the bowl of an electric mixer (or in a bowl with a handheld mixer) at medium-high speed until foamy. Add the sugar gradually in three batches and continue beating until very fluffy and pale yellow. Add the sifted dry ingredients to the eggs in three batches, folding each one into the egg mixture with a rubber spatula until just a few streaks of white remain. Scrape the batter into the prepared pan and smooth it into an even layer, making sure to poke it into the corners. Bake until the cake is golden brown and it feels spongy not tacky to the touch, 14 to 16 minutes. Make the filling: Beat the heavy cream and confectioners' sugar in the bowl of an electric mixer (or in a bowl with a handheld mixer) until it is fluffy. Add the vanilla and continue beating until the cream holds soft peaks when the beater is lifted from it. Add the cream cheese half at a time and beat just until blended into the cream. Scrape down the sides of the bowl. Line your work surface with a sheet of waxed or parchment paper. Invert the cake onto the paper and lift off the pan. Peel the paper off the top of the cake. Spread the jelly in an even layer over the cake, leaving a ½-inch border around the edges. Do the same with the cream cheese mixture. Starting at one of the short sides, roll the cake up into a compact roll, working gently to avoid tearing the cake or squeezing the filling out. Set the cake seam side down on a serving platter. Cover with plastic wrap and chill for at least 2 hours or up to 1 day before serving. To serve, sprinkle a dense coating of confectioners' sugar over the cake. Cut into 1-inch slices. The batter came out so light and fluffy. When I saw all of the bubble I knew I was on the right track. **NOTE** I searched high and low for guava jelly and of course I didn't find it until after having made the cake... In the end I used a mango jelly that I found at Whole Foods. When I was just browsing through the Goya shelf at Stop & Shop I ended up finding the guava jelly next to a mango jelly. I think both of these flavors would work very well. I should mention today's my Dad's birthday!! I wish I could pack this up and ship it down to Charleston where my parents live... Lots of love from CT, Happy Birthday Dad!! So with all of this said, I hope you are as inspired as I was to make this cake. It's not often that I make something more than once but this turned out so well I will definitely make it again. I even got over my fear of making the roll! I thought for sure I was going to crack the cake in the process. If you enjoyed this post please don't forget to vote for me in the Food Buzz Challenge to find the next food blog star!! Wonderful post and a lovely cake! Mexican cake is very similar to Filipino cake rolls, I guess it's the Spanish influence in both Mexico and the Philippines. This is just lovely! Great post!! And thank you for your nice tweet! Best of luck in PFB! This looks so impressive! I never make desserts - I might just have to change that now! Hmmmm I love cake rolls. Especially if guava jelly is involve. This dessert looks super delicious! I am definitely going to try this recipe out. Good luck! I'm a jelly roll fanatic. Usually go for rasberry and coconut or lots of whipped cream. Creative filling with the guava. I think I would love this dessert. I enjoy your blog, beautiful food and photos. You have a vote from me. Great job on the roll cake. Came out perfect. Good luck! Thank you for all of the comments & votes!! Yes this really was super easy to make and it got me over my fear of making a "constructed" food!! what a stunning #pfb2010. i love that you did dessert. 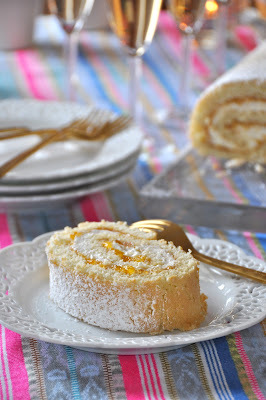 Of course the wife of the Birthday Dad is gloating over the that gorgeous jelly roll. That whole demo is point on....ohhh, how I wish I could have a bite. Looks absolutely delicious! You have my vote! And a happy belated bday to your dad! Thanks for all the votes guys!! My fingers are crossed!! oh my goodness.....i m a dessert lover too and this looks too delicious....i have been dreaming of swiss swirls lately maybe i'll take your recipe for an inspiration and go for it!